It won't work...with or without the quotations." Assuming the URL you're including in the URL HERE section of that code is a valid link to a photo, you're definitely doing the right thing. You want quotes around the URL and you need to make sure there are no spaces before or after the URL inside the quotes. There are a couple of reasons the process might fail even if you are doing everything correctly. One possible reason linking to an image might fail is if it's hosted on a site that doesn't allow links from external sites. Some sites attempt to prevent their images from being used elsewhere by blocking any attempt to display the image outside the site's Web pages. One way around this issue is to save the image you want to post in the comments to your hard drive and then upload it somewhere else. Depending on what the image is, you might be violating someone's copyright in doing this, but it is a way to post the image. Another possibility is that your friend has images turned off in their profile. 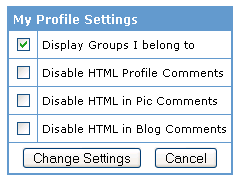 Under the Account Settings option of every profile, the Profile Settings option allows you to Disable HTML in Profile Comments, Pic Comments and Blog Comments. Check "Disable HTML Comments" if you want to prevent people from posting HTML (including, images, flash files, ect.) in your comments section. In this case, the only way to post an image to the comments is to get your friend to allow HTML in their comments. 1) Upload the image you want to post in the comments somewhere online. This can be your MySpace Pics section or a photo sharing service likeFlickr. 2) After uploading the image, right-click the image and choose properties from the right-click menu. 3) Select the Address of the image and copy it. 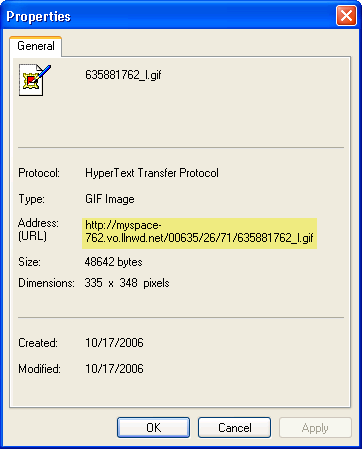 4) Add <img src="http://myspace-762.vo.llnwd.net/00635/26/71/635881762_l.gif"> to the comment on your friend's MySpace page, replacing the address between the quotes with the address to your own image. Make sure the address for the image ends with something like .gif, .jpg, .jpeg, or .png or it's likely not an image. Make sure the address for the image includes the http:// at the beginning or it won't show up when you paste it in the code for the comments.